A common electronic freight management would improve the speed, accuracy, and visibility of information transfer in a freight movement, which could reap large rewards for the U.S. economy. Freight volumes by 2020 are forecasted to increase by 70 percent from 1998 totals. The amount of freight moved through international ports of entry for goods shipped to the United States (or "gateways") – including seaports such as Long Beach, California, land border crossings, such as Detroit, and international airports such as JFK in New York – could more than double. Improving speed, accuracy, and information transfer when freight is transferred from one mode of transportation to another benefits the U.S. economy. The EFM initiative builds on a previous ITS freight operational test that focused on one domestic truck-air-truck supply chain. The test demonstrated a cost savings of $1.50–$3.50 per shipment, due mostly to time and labor savings. The EFM effort will test the technology and business case elements of an international supply chain deployment. It has the potential to reduce the amount of paper used in the transfer of information among the supply chain elements (e.g., manufacturer, shipper, freight forwarder to air carriers). Work to date has been focused on truck-air-truck freight interface. Building on the success of an electronic manifest in the truck-air-truck interface, the next step could include other modal interfaces (e.g., truck-truck, truck-rail, rail-sea, and truck-sea). EFM can help reduce congestion in air terminals, such as the air cargo consolidation center (shown here) at O'Hare International Airport in Chicago, IL, and decrease erroneous and duplicative shipments that can lead to highway congestion. 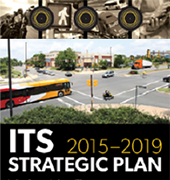 The goal of the Electronic Freight Management initiative is to bring improved operational efficiency, productivity and security of the transportation system through the use of a common electronic freight management (EFM) and message portal that enables access to shipment information to all supply chain partners in real time. Intermodal Freight Technology Working Group – A neutral organization for industry and government to work together on applying technology to freight issues of mutual concern. 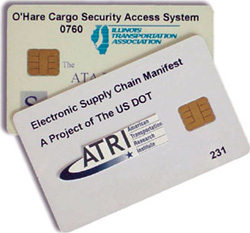 Biometric smart cards, like the ones shown here, contain information on the truck driver, including a photocopy of a commercial driver license and the driver's thumbprint. This information (contained in the gold-colored chips) is used to expedite the movement of cargo through intermodal transfer facilities and trucks through border crossings. Working through International Standards Organization (ISO) on all three. Operation Plan and Tools – Develop a concept for allowing an electronic message to move through a virtual portal for all supply chain partners to have equal access. System Architecture – Develop an architecture approach for information flows between the virtual portal and the traffic management centers and traveler information systems. Map the supply chain and model the changes that an EFM would require. Determine the rules of engagement for partners. Determine the operating procedures for adopting EFM, FIH and biometrics. All procedures in place and adopted. Operate over 6–8 month period of time with new procedures. Gather baseline data before test and operating data during test. The EFM project focuses on improving planning efficiency between truck transportation and airfreight carriers such as this plane. What are EFM and CEFM? The Electronic Freight Management (EFM) initiative is a USDOT-sponsored project that applies Web technologies that improve data and message transmissions between supply chain partners. It promotes and evaluates innovative e-business concepts, enabling process coordination and information sharing for supply chain freight partners through public-private collaboration. 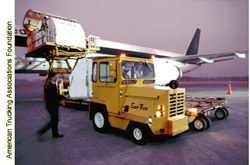 The CEFM (Columbus EFM) project was a successful 2007 deployment test which implemented web services and other components to support an existing international import truck-air-truck supply chain. The goal is to provide a mechanism for sharing supply chain freight information that is simpler, cheaper, and more efficient to implement than traditional EDI, allows for all, but especially small to medium sized and less sophisticated, supply chain partners to access the information, and makes it easier to customize the flow of information between and among partners. Another goal of the initiative is to design a system to ensure that data are entered once but used many times, thereby eliminating data transcription errors. EFM aims to help companies replace paper trails with electronic information, freeing up human resources that were previously devoted to manual data entry. What will EFM do for me? Rather than creating large databases for each partner to collect and maintain shipment related information, the web services approach used with EFM allows partners to maintain only the data they “create” and then share that data with other authorized users through a common web interface. This reduces the amount of duplicate data entry and the associated data quality problems. This has the potential to greatly reduce the cost of providing daily status reports to shippers and to reduce the time required to complete these tasks (from 4-6 person-hours down to less than a minute). Implementation of digital certificates and “XML signatures” provides the data integrity and security necessary to insure protection of their information. The CEFM Deployment Test used standardized data exchange among trading partners based on the Universal Business Language (UBL) version 2.0 data standards and then extended for use within the chosen supply chain. In addition, EFM allows users to reliably and uniquely identify each transaction for all authorized supply chain partners. 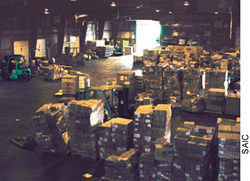 This unique consignment reference (UCR) was developed based on the approach favored by the World Customs Organization (WCO) and was used satisfactorily as the key shipment identifier in the deployment test. The transportation status data element used in CEFM was submitted as a standard and has been accepted into the next UBL revision. Will my trading partners use it? EFM focuses on the entire supply chain of shippers, carriers, forwarders, distribution centers, suppliers, and receivers. It is particularly well suited for small and medium sized partners with limited technology sophistication. The reduced cost and complexity associated with implementing this technology will make it easier for small- and medium-sized partners to connect with each other and provide and use automated visibility information. The CEFM test demonstrated the ability to provide shippers with better quality data, more efficiently and more quickly. Reduction in duplicate data entry allowed participants to enter data once but use it many times. Results of the CEFM test have been documented. Some of the key uses of the CEFM data – and benefits - were by the freight forwarders, overseas manufacturers, customs broker, and container freight station operator. Particularly if a supply chain owner initiates an EFM effort with its partners, those partners will use the technology and find improvements in data quality and availability. The answer depends on the number of partners and the extent of integration of EFM with back office systems. The EFM web services and architecture developed as part of the EFM initiative are being made available by USDOT at no cost to industry (See the Program Documents tab). 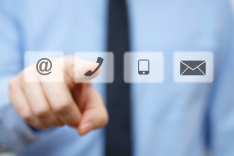 The EFM web services perform some of the data exchange functions; EFM uses the Internet for its network communications, which can be obtained through existing internet service provider connections. These components make information exchanges with partners and with back office systems easier and cheaper and help ease implementation and deployment, especially compared to a typical EDI implementation. EFM requires computer server resources, but does not require dedicated hardware, so existing computers can be used.